Mini Loops is a very useful plugin to feature posts in widgets area. It is also can be included to template files. We’ll use it to feature some more posts on a blog’s homepage. 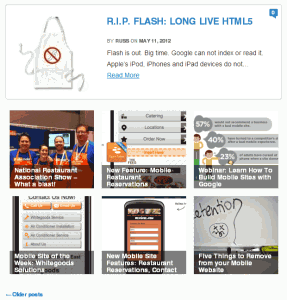 I want to show some 6 rectangles with links to next posts after first 4 posts on homepage. In Reading Settings of WP admin I have “Blog pages show at most 4 posts.” We’ll be able to skip this first 4 posts in our second loop. Check the picture to see how it gonna look below my regular posts display. The new loop will also cut pictures from given source. After installing Mini Loops plugin I’m opening index.php in my child theme and looking for original part of Twenty Eleven Theme code. Here we will add miniloop plugin code. This entry was posted in WordPress and tagged mini loops. Bookmark the permalink.